There is a range of options for assisted living in Fort Myers, too. These resort-like communities enable residents to maintain their privacy and independence while receiving the level of care and support they need. But assisted living goes beyond that. These communities foster fun, engaging, and social environments that promote healthy aging and boost quality of life for seniors. Most often, the first questions that people searching for assisted living in Fort Myers ask are related to cost—and for good reason. Long-term care plans don’t do much good if you or your loved one can’t afford the long-term costs. Assisted living bundles nearly all living expenses together into one monthly payment. That includes lodging, meals, in-home care, transportation, homemaking services, laundry services, social activities, and fitness and wellness programs. Depending on care needs and location, many people find that the cost of aging in place actually outweighs the cost of assisted living. Use an online cost-of-living calculator to add up your current living expenses and to compare them to what your monthly expenses would be for assisted living in Fort Myers. Senior care coordinators are on hand at senior living communities to help put together financial plans and to make monthly costs even more affordable. Would you believe that being part of an assisted living community in Fort Myers can actually lower your blood pressure and improve your ability to fight illnesses? It’s true. “Stress-buffering” occurs when seniors are engaged in social networks and friend groups; it helps them better cope with stress and anxiety, reducing physiological stress responses and improving health over time. So, it’s no mistake that assisted living in Fort Myers fills event calendars with a wide range of activities that are designed to keep residents with all different types of interests engaged and involved. From day trips to Manatee Park or Captain Jack Boat Tours to arts and education to purposeful living and spiritual exploration, finding assisted living that caters to your or your loved one’s interests will not only make you happier, but it’ll make you healthier, too. Many people who move into Fort Myers assisted living say they wish they’d have made the move years ago. The reason many people delay is that they feel like they’re “getting along OK” and don’t need as much assistance or care as people who live in assisted living communities. However, assisted living offers a range of individualized care plans for seniors who need everything from minimal assistance to more comprehensive care. Barrington Terrace of Fort Myers, for example, offers a complimentary wellness assessment to help determine individual care needs and to put together a customized care plan. Flexibility helps contain costs by providing the level of care that you need, when you need it. It also encourages freedom and independence among residents, who are free to come and go as they please, taking in a show at the Barbara B. Mann Performing Arts Hall at Florida Southwestern State College or just going for a Sunday drive. A small percentage of people younger than 70 experience Alzheimer’s disease or other forms of dementia that require memory care. But 32 percent of those 85 or older need memory care, studies show. Those seeking assisted living in Fort Myers now might not be in need of memory care, but odds that the need will arise grow greater with age. Continuing care communities enable residents to transition from assisted living into memory care if the need arises. A floor or a wing of an assisted living community might be devoted to memory care. There, residents receive specialized sensory-based and cognitive care training tailored for people with dementia. Additionally, 24-hour care and supervision, nutritional support, and family counseling are available. 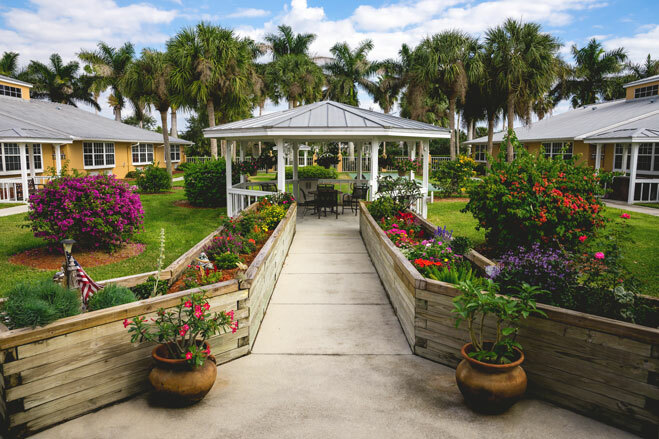 Assisted living communities like Barrington Terrace of Fort Myers that enable residents to transition into memory care if the need arises bring another layer of flexibility that ensures residents’ current and future needs can be met without a disruptive move to a new community. Assisted living in Fort Myers can be an affordable way to not only meet your or your loved one’s care needs, but to improve your or their overall health and well-being through engagement and socialization. The key is to find an assisted living option with the flexibility to meet care needs, both today and tomorrow. Continuing care communities that offer memory care provide another layer of flexibility. And senior care coordinators are on hand to help answer questions and put together financial plans. Learn more by contacting Barrington Terrace of Fort Myers.